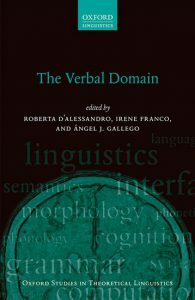 The Verbal Domain, the book I edited with Irene Franco and Ángel Gallego, is out. The book investigates the nature and structure of the verbal domain and the complexity of the Verb Phrase (VP). It is divided into three parts, representing the areas in which contemporary debate on the verbal domain is most active. The first part focuses on the V head, and includes four chapters discussing the setup of verbal roots, their syntax, and their interaction with other functional heads such as Voice and v. Chapters in the second part discuss the need to postulate a Voice head in the structure of a clause, and whether Voice is different from v. Voice was originally intended as the head hosting the external argument in its specifier, as well as transitivity. This section explores its relationship with “syntactic” voice, i.e. the alternation between actives and passives. Part three is dedicated to event structure, inner aspect, and Aktionsart. It tackles issues such as the one-to-one relation between argument structure and event structure, and whether there can be minimal structural units at the basis of the derivation of any sort of XP, including the VP. The TOC and more info are here. Enjoy!